The levels of potentially hormone-disrupting chemicals in the bodies of teenage girls plunged just three days after they stopped using certain cosmetic products, shampoos and soaps that contained the problematic substances, according to a new study led by Kim Harley, Ph.D., a researcher with the Center for Environmental Research and Children’s Health at the University of California – Berkeley. Harley, a reproductive and perinatal epidemiologist. and her team, from the Environmental Health Laboratory of the California Department of Public Heath and the Clinica de Salud del Valle de Salinas in Salinas, Calif., selected safer products using EWG’s Skin Deep database. The volunteers, 100 Latina girls between 14 and 18 years old, all from Salinas, Calif., pledged to refrain from using their regular personal care products for three days and instead to rely solely on products free of the suspected endocrine disruptors phthalates, parabens and triclosan. 27 percent down in mono-ethyl phthalates. Phthalates, common industrial plasticizers, show up in some nail polish and fragrances. That you can lower your body’s levels to worrisome chemicals is the good news. The bad news is, the federal Food and Drug Administration has virtually no authority over the personal care products industry and nearly all chemical ingredients manufacturers use to make these items. Companies can use almost any chemical or combination of chemicals without first having to prove them safe for human health and the environment. The personal care products industry’s behavior is perfectly legal and has been standard practice for decades. And that has exposed every American to innumerable potentially toxic chemicals by way of soaps, shampoos, makeup and countless other items, even those used on infants. Legislation authored by U.S. Senators Dianne Feinstein (D-Calif.) and Susan Collins (R-Maine) proposes to overhaul the lax regulations of this industry. 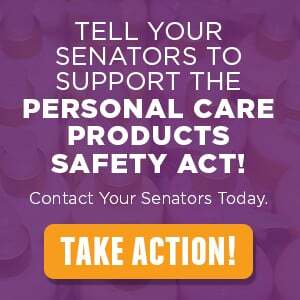 The Feinstein-Collins Personal Care Products Safety Act would give the FDA tools for ensuring the safety of personal care products as strong as those that regulate food and drugs. The bill would require the FDA to investigate the safety of five cosmetics ingredients and contaminants yearly. Cosmetics makers would be required to register their manufacturing facilities and disclose the ingredients they use to the FDA. They would be mandated to report incidents involving harm to health. The bill would give FDA authority to recall dangerous products. It would manufacturers to label their producgts with disclosures and warnings, in cases of ingredients that could pose problems for some consumers. Major industry leaders are now on board with the effort to protect Americans from potentially risky chemicals in cosmetics products. Some of the corporations backing the Feinstein-Collins bill include Revlon, Proctor & Gamble, Johnson & Johnson, Unilever, L’Oreal, California Baby and the industry trade organization, the Personal Care Products Council.